Hey guys, have any ideas as to what has happened. So do they look ok on your PC or are they messed up on that too? Do you verify your burns too? That all go ok? Hey Lightning, the image was snapped of my PC and it's identical to the one on my TV. All my burns are verified and each one went without incident, I'll include a log if that helps? and a DVDinfo screen shot. I 10:00:05 ImgBurn Version 1.3.0.0 started! I 10:00:05 Found 1 DVD+RW and 1 DVD?RW! I 10:09:07 Export Successfully Completed! I 10:15:59 Export Successfully Completed! does the same thing happen if you mount the iso in daemon tools and watch it with power dvd? I'm unable to do that corny, i got rather off i deleted the files thinking they were no good. Out of curiosity what would that tell us? Could it have been a problem when creating the origional files? and if the image was corrupt, you'd go back to the video_ts folder/files (if they ever existed). After that you'd go back to whatever created the files...etc etc. Somewhere along the line you'd find the problem! After that you'd go back to whatever created the files...etc etc . Hey guys, I've burned the files again, this time successful. I've tried to recover the original file(unsuccessfully) so i can't tell if they were corrupt or not. This time i used an alternative method to create the .ISO file for burning, hence the success i presume. I'll use the original app' for the next couple of burns and see what happens, but can i ask if there is any way to check the integrity of the file before burning...? but can i ask if there is any way to check the integrity of the file before burning...? Yup, as per corny's quote below. mount the iso in daemon tools and watch it with power dvd? 2.) there is a problem with the physical disc, either during the burning process, the dye itself, or the reflectivity of the surface. All of which could be either a dying burner or a bad disc, even in a batch of good ones. mkisofs log for DVD "#############################_DISK1"
The burn failed during ImgBurn with the following message: ?Failed to read from the file: #########################_Disk1.ISO? 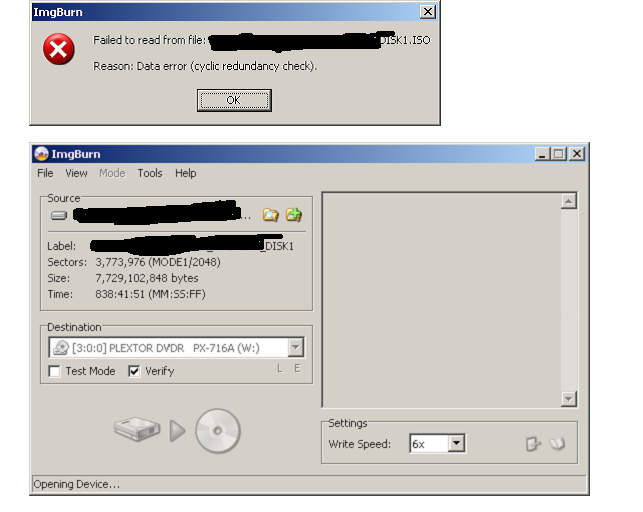 Reason: Data error (cyclic redundancy check).? 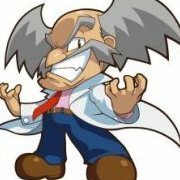 I 00:47:57 ImgBurn Version 1.2.0.0 started! I 00:47:57 Found 1 CD-ROM, 1 CD-RW, 1 DVD-ROM and 2 DVD?RWs! E 00:56:19 Reason: Data error (cyclic redundancy check). I mounted the ISO file using DAEMON tools and then tried ripping the ISO file back to the HD using DVDDecripter. I 01:27:34 DVD Decrypter Version 3.5.4.0 started! I 01:27:35 Found 1 CD-ROM, 1 CD-RW, 1 DVD-ROM and 2 DVD?RWs! I went back and repeated the generation of the ISO file a second time from the same VIDEO_TS folder and the resulting file was ok and burned without any errors. . A scan of the HD that contained the ISO file with the reported error did not show any errors, nor were there any error in the system log files. Note I have edited out certain items in the log and screen capture with ?#####?s? to protect the innocent. I haven?t seen a reoccurrence of this problem. Don?t know if this helps but??. Note UK I probably should have posted this data back when the error happened, but since it only happened one time as far as I can tell, I decided not to bother you at the time. I hope this adds something to the discussion. There shouldn't be any reason for Windows to throw that error unless there really is/was a problem reading from the hdd. Maybe all it needed was to have those sectors written to again and that fixed them. Hey db, I'm inclined to go with option 1 in that the app' i used to create the file was the cause of the problem. I switched to an alternative method to create the files for the burns that were sucsessful. As for using RW media for testing purposes, It never crossed my mind but something i shall implement forth with. That said re-writable media is something i do not posses and really know nothing about as I've never used it. What would you recommend in that department. DB really is the RW king, To the best of my knowledge he's by far the biggest RW user within the beta team. He should be able to put you on the right tram with that question. Yeah, that's right, good when you're trying track down problems without wasting good media. I use them for that, and storing temp data, like backups. I was unsure at the time, but from your reply I take it that was an error from XP not an internally detected error with the data on the part of ImgBurn. I guess I'm puzzled about several things. Were the W 01:31:39 Sector 1778984 - Pack Header Not Found (0x52494646) and W 01:31:39 Sector 1778985 - Pack Header Not Found (0x00000000) messages in DVDDecriptor equivalent to the same error (In this case with the image mounted as a vitrual drive via Daemon tools)? that is, does Daemon tools pass the error on to the using program? Also I believe that I went back and did a full scan of that logical drive using Computer Manager/Properties/Tools/Error Checking to scan the disk prior to generating the file the second time, there were no reported errors? Not to beat a dead horse, but any additional light you could shed on the topic would be appreciated. It'll be a bit longer than 10 minutes. The last time I checked, 4x was the max speed for RW media but I never use them except for transferring stuff from a DVD recorder to PC. You'll probably enjoy the things that Lightning_UK! is adding to ImgBurn that we're still testing (i.e. playing with and attempting to break) for ISO creation. It's very slick indeed. My favorite is Iron Chef Chen Kinichi. Oh, like how Sakai-san, apparently, thinks anything can be made into ice cream? As for what I would recommend, well, just don't get any CMC. Other than that, what I've found that works well for me because I can get it easily here in town as the ones from Office Depot, which are Riteks with their badge on them. However, picky players like the Playstation 2 have had some random skipping problems on playback, but, the kind that are truly random. Meaning, you can rewind back over the brief pause and resume play and not get it again. Unfortunately, there's no real recommendation to make. You have to just find what works for the hardware you have. One of the real problems, IMO, with writable DVD's of any kind. Despite there being a book standard, very few hardware manufactures and some disc manufacturers just choose to ignore them and slap anything together. On the DVD+RW side, though I normally prefer - to + in general across the board, I've found Maxell and HP DVD+RW discs played without problems in all the test hardware I currently have.